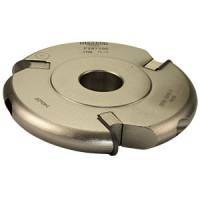 A robust adjustable chamfering block with a 50mm blade length. It is suitable for jointing and chamfer cutting in all natural timbers and man made boards. The maximum adjustment is 90 degrees either side of the centre position and the cutting angle is infinitely adjustable with a smooth geared action. A vernier scale allows the block to be adjusted in 1 degree steps. As the cutting head may be adjusted up to 90 degrees from the vertical it also offers the option of using the block for panel raising.